Soul Electronics today unveiled the new Combat+ Sync, its first fitness-oriented, music-sharing Bluetooth headphones with walkie-talkie capability. 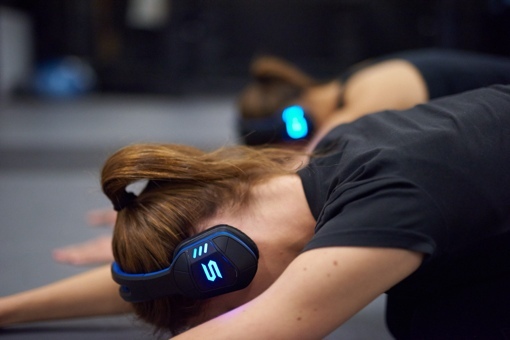 The Combat+ Sync is designed to deliver high-quality music to you and your friends while you work out, allowing you to communicate with yoga partners, crossfit coaches and workout partners without having to remove your headphones. As the name suggests, the biggest benefits of the Combat+ Sync don’t come into play until you sync two or more pairs to each other. You can then use the SOUL smartphone app to share songs and sync workout rhythms, so you can have a shared intensity even if you don’t share music. The built-in mic and walkie-talkie feature, meanwhile, lets you communicate wirelessly with other Combat+ Sync wearers. According to Soul, the new headphones are of high-quality construction – it has a flexible headband that can survive drops, an ergonomic and sweat-proof design and washable mesh ear pads (similar to the Urbanears Humlan). The Combat+ Sync lasts 15 hours on a full charge, so there are no worries about it quitting mid-workout (or mid-marathon). It even gives off a customizable and pleasing LED glow that helps you get noticed by traffic while running. Looking to give Soul’s Combat+ Sync headphones a try for yourself? You’ll need a bit of patience – these headphones are expected to ship in February 2016. You can reserve your pair by visiting the company’s Kickstarter campaign for the headphones and pledging $199. Larger multi-packs are available in case you want to outfit and entire team or class, but quantity discounts are limited. To learn more about Soul, visit the company’s website.